The British Gazette » Brexit. Flexcit. What’s the difference? It comes down to Hobson’s choice! 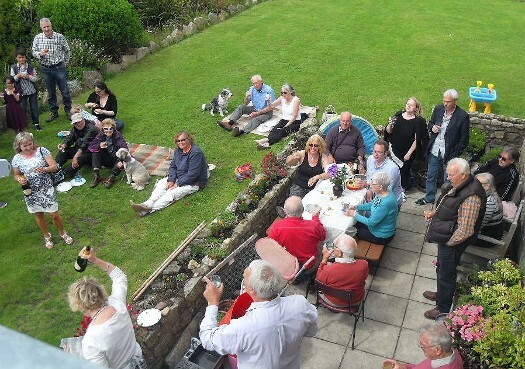 Above UKIP members celebrating in Bob and Tacy Smith’s garden. Yesterday members of UKIP in Cornwall celebrated their recent success at a party hosted by Bob and Tacy Smith near New Mill. It was a very pleasant occasion and of course there is no need to mention the main topics of conversation! Although not having a vote in the Tory leadership race (Conservative Central office not seeing fit to extend the franchise to members of UKIP!) many were hoping that Andrea Leadsom and/or Michael Gove would be a good choice for Tories to make. Your editor did not make himself popular by agreeing! This organ would disagree with Mr Hitchens on one point in this sentence; We do not consider it was that Mrs May “lacked the nerve” but that she was “hedging her bets.” Nobody actually knew how the vote was going to go. For example, this organ had called it for the Remainians after the assassination of Mrs Cox. He was right. At first the cross party Brexit campaign, “Vote Leave” did not at first pursue UKIP’s strategy. Then it changed and adopted this and Nigel Farage was reported as saying that he cheered and cheered and cheered in response. It is in fact the adopting of this strategy by “Vote Leave” that causes Mr Gove to be an unsuitable choice for Tory leader and Prime Minister. This is because Mr Gove is unable to deliver on Vote Leave’s campaign pledge to introduce Mr Farage’s “Australian points based immigration system”. This then is the paradox. The electorate voted for Brexit on the basis of Mr Farage’s “Australian points based immigration system”. Brexit can only be delivered via Doctor Richard North’s (and others) Flexcit – which is NOT what “Vote Leave” campaigned upon! In other words – there is NO mandate! Brexiteers are demanding that one of their number (who has of course got to be a member of the Conservative party!) should occupy the post of Prime Minister. But they have a basic problem with such as Andrea Jacqueline Leadsom (née Salmon) Mrs Leadsom, who like Mr Gove cannot deliver what she campaigned for so recently! This is the hole all who actively took part in Vote Leave’s campaign have dug for themselves! Thus it is that only a politician such as Mrs Theresa May can be appointed to deliver Brexit in the form of Flexcit! Let us reassure ourselves that Mrs May was a reluctant Remainian who has a history of being a Eurosceptic. That the European Communities Act of 1972 and later treaties ratified as a result, has caused Privy Councillors to break their oaths by which they undertook to ensure that no foreign prince, potentate or power shall have precedence in this land and that Her Majesty was put in breach of her Coronation Oath to govern us according to our laws and customs and not those of the EC/EEC/EU. There is a further paradox which curiously will prove helpful. When it is clear that Brexit will take the form of Flexcit, Nigel Farage and UKIP will excoriate the ex-Remainian Prime Minister Mrs May for not keeping “Vote Leave’s” pledge on immigration. Nigel Farage and UKIP will of course have the freedom that is the preserve of those politicians and parties with no prospect of forming a government to make these claims. Flexcit then may come to be seen as a form of compromise between remaining in the EU and leaving it, a sort of half way house. Be in no doubt however; Flexcit DOES deliver Brexit. Nigel Farage and UKIP’s likely opposition to Flexcit and Mrs May as Prime Minister (who will be perceived by UKIP as a Remainian) will in fact be a GOOD THING! This is because Flexcit can be portrayed as a compromise – as an “olive branch” to the 48% who voted Remain. That Flexcit is “Hobson’s Choice” and is in fact Brexit is a detail that hopefully can be successfully “spun over”. That Nigel Farage’s version of Brexit can be spun as “the Real Brexit” and Flexcit as some form of “half way house” and a compromise will help matters enormously as it will enable some of those members of the public who voted Remain to believe that they have been accommodated. It comes to your Editor’s mind that the whole British nation may own a great debt of thanks to The Right Honourable, The Lord Ashdown of Norton-sub-Hamdon, PC, GCMG, CH, KBE, for upon hearing the result of the referendum in the early hours of Midsummer’s Day, Friday 24th June 2016 tweeted, “God help this country!” Well the noble Lord’s prayer to the Almighty may have been heard! Although not in the manner as His Lordship may have expected, but then the Lord (the Almighty, not Lord Ashdown!) moves in mysterious ways His wonders to perform! This of course will suit Nigel Farage and UKIP wonderfully well for they will be able to campaign in Labour’s northern heartlands as these good folk will still be adversely affected by EU migration. UKIP’s main problem will be from making the transition to a leftist centre left party from its present position of a rightist centre right party to attract these votes. UKIP’s biggest problem will be that there will be no more European Parliament elections for them to take part in and therefore no more EU funded perquisites! It is therefore likely that in future, Wales will be a UKIP heartland due to the small measure of PR in the Welsh Assembly. And here we come to the Great Irony; the two British political parties campaigning most vociferously for PR will be the Liberal Democrats and UKIP! Thank you Peter, it aroused fond memories and wonderful to see the folks I know from my days on the committee at Bob and Tacy’s party. We lonely old expats in New Zealand wish all of you, all the best and will keep trying to educate the insecure Kiwis here, it was the correct thing to do, because most have no idea of the restrictions and unwanted laws pushed on to the UK by UN-ELECTED members of the EU, and they moan and whinge here about the few LEGAL immigrants they accept into NZ.